Indulge and impress with this extremely flavorful and moist Triple Chocolate Fudge Layer Cake for any special occasion or just for the sake of chocolate cake. Baking from scratch is an act of love to me. Its true that baking is chemistry and you need to follow the steps and measurements precisely to have the same results again and again (maybe that’s why my Type A personality is drawn to it), but still – the results of said precision tastes like pure heaven only because someone cared enough to do it. Which brings me to this recipe that I made for my husband’s birthday. His request was for all chocolate; intense, fudgy chocolate and I was determined to give him exactly that. Around here, I’m the dessert addict who wants all of it while he could kind of care less – unless its excellent. So, I knew his annual birthday cake had to be the best one yet. The results? He told me it was restaurant quality and is not letting me take any of it in to work. That is the most flattering compliment I could get considering he’s my toughest baking critic! In fact, by time I post this I guarantee this four-tiered Triple Chocolate Fudge Layer Cake will vanish from my kitchen. My goal for this cake was for it to scream “chocolate”. Are you someone who doesn’t care for chocolate cake because you’ve had too many bland and dry versions? That’s me. I even went through a phase of thinking I didn’t like chocolate cake. Oh, was I wrong; I, in fact, love chocolate cake. 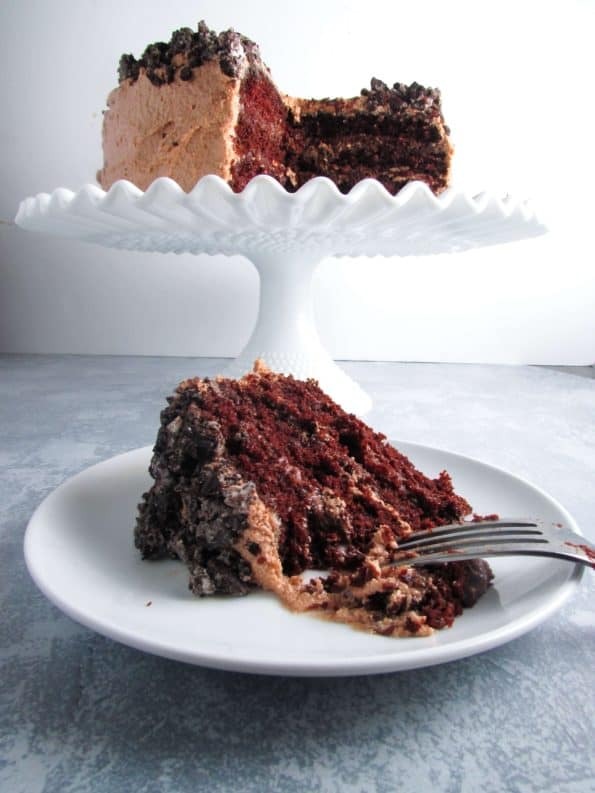 This moist, fudgy, thin layered cake with unbelievable fluffy frosting proved that to me. If you’re intimidated by making a layer cake or even just a cake that’s not from a box – don’t be! Cooking has been in my veins since I was born, but baking I only picked up around 2012! That being said, its really not too complicated. There are a lot of steps, but easy ones at that. My advice for anyone just starting out with baking whose feeling ambitious is to slow down, measure your ingredients, and read the directions. I’ve made so many mistakes in the past just by going TOOO fast! Also, try to bake in small stages — for instance I made this over the course of 3 days, not all in one day. This cake is indulgent, addictive, and tastes rich. However, its not overly sweet – although it does go great with a glass of milk. 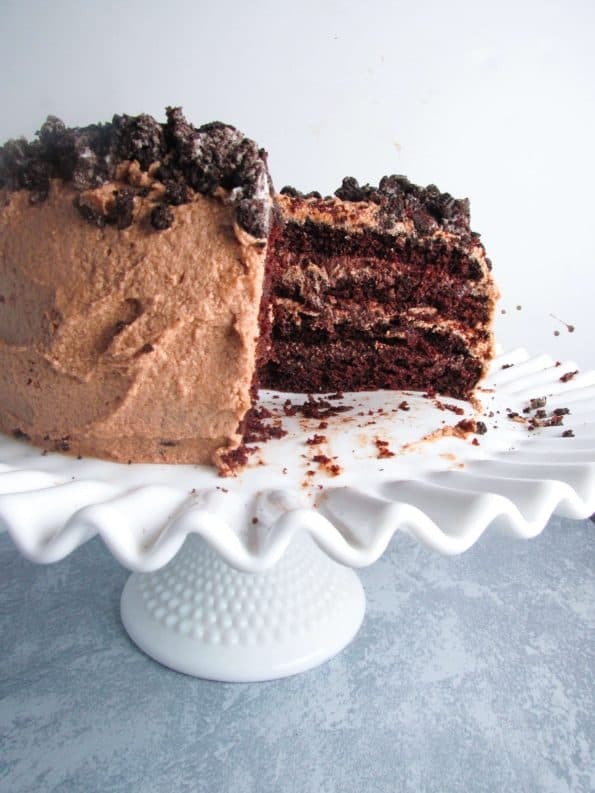 The layers in between the cake alternate between chocolate pudding/mousse and chocolate ermine frosting which makes sure that you get a bit of everything in every bite and the whole thing is flat out moist. A few other things about this recipe. I took inspiration from a few other amazing food blogs to start as a base for my recipe. The cake itself is straight from Add a Pinch. Her “Best Chocolate Cake Ever” recipe was exactly what I was looking for so why re-invent the wheel? Plus, I found that it lives up to its name. It has buttermilk and vegetable oil in it so, we’re straight up indulging for this recipe — but it’s oh so worth it. The pudding/mousse filling is from King Arthur flour! I took it right out of their Chocolate Fudge “Blackout” Cake. I use King Arthur flour exclusively and am a huge fan of their recipes. So, essentially, I took 3 different recipes and combined them making one great big cake. The part I had a lot of fun with was assembling it all to make it exactly what I wanted. I baked two layers of the cake and then cut each one in half. The frosting was light enough to be used as one of the fillings between layers and the mousse was the filling for the other two layers. On the outside, I decorated with crushed Oreo’s because it’s definitely my husband’s favorite cookie! The filling needs to set overnight, at least for 12 hours, so make this the day before you bake the cake. Put the chocolate chips, salt, sugar, and espresso powder in a food processor or powerful blender and pulse until finely ground. Add the egg and pulse until everything is combined. Heat the cream in a bowl in the microwave or in a pan on the stove on medium-high heat. Heat until the cream just starts to bubble. If you have a thermometer, it should be at least 205 degrees F. Heating the cream is crucial because it helps cook the egg, otherwise the filling won’t set properly. Turn the blender or processor on low and slowly add in the cream. Add in the vanilla and combine everything well. Pour the filling in a bowl and refrigerate until its chilled and set, overnight is best. Preheat the oven to 350 degrees. Add flour, sugar, cocoa, baking powder, baking soda, salt, and espresso powder to a large bowl or into a stand mixer. Whisk or stir until well combined. Add milk, vegetable oil, eggs, and vanilla to flour mixture and mix together until well combined. Carefully add boiling water and keep mixing until everything comes together. Distribute cake batter between two prepared 9” cake pans. Bake for 30-35 minutes or until a toothpick comes out clean. When done, turn them out onto cooling racks and let cool completely to the touch before handling. Whisk together the flour and milk in a small pot while cooking over medium heat. Stir constantly until it starts to thicken. Remove from the heat and let cool completely. If it’s too warm it will melt the butter and make the frosting greasy. I put it in the fridge to speed the process up. While waiting, in a bowl or stand mixer, beat together the butter, sugar, cocoa, and salt until it starts to get fluffy. Mix in the vanilla extract. When the flour mixture has fully cooled to room temp, add it in to the creamed butter. Keep mixing until the frosting is whipped. Make sure that your cakes are completely cooled. Carefully, place the first cake layer on the surface where you will be leaving the cake (cake stand, plate, etc). Using a sharp serrated knife, slice the cake in half and move the top portion to the side for now. Coat bottom layer with half of the chocolate filling. Top with the thin-cut cake layer. Top with ¼ of the chocolate frosting. Place second layer of cake on top. Cut horizontally, moving the top portion to the side. Cover the 3rd layer of cake with the remaining chocolate filling. Place the last layer of cake on the top. 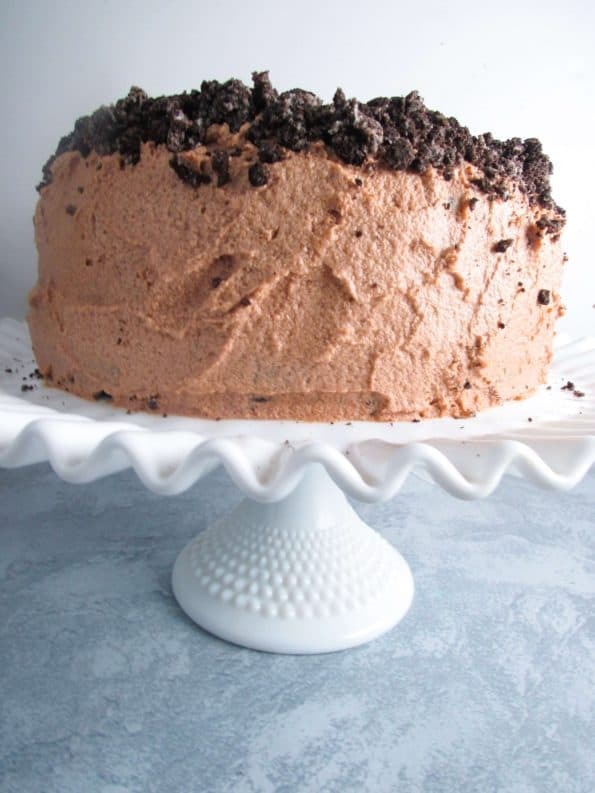 Start frosting the outside of the cake using an offset spatula – this is only the first coat or crumb coat, so you don’t need to cover it entirely. Place the cake in the refrigerator for 30 minutes until the frosting is a bit hardened and easier to put a second coat of frosting on. Frost final layer of chocolate frosting, using as much of the rest of the frosting as you need or want. Use your imagination for the decoration! 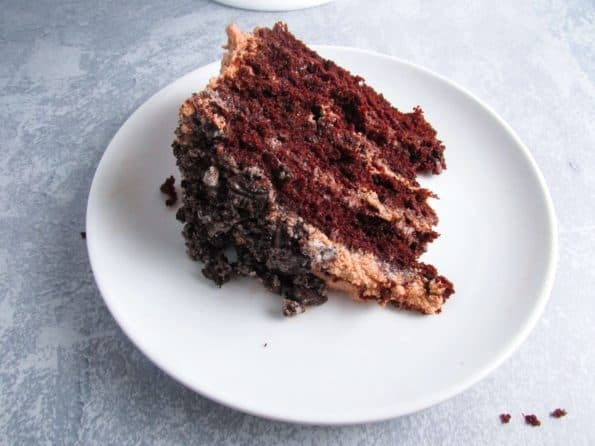 For this cake, I rolled two sleeves of Oreo's in a plastic bag with a rolling pin and then gently placed it around the perimeter of the cake. Now go savor every last bite of your masterpiece!